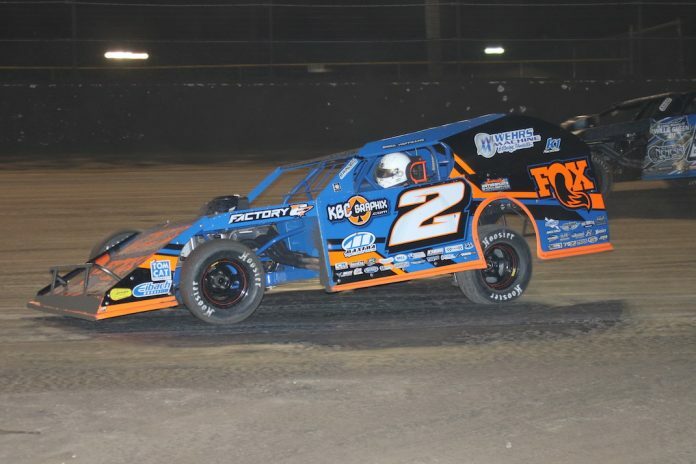 BARBERVILLE, Fla. — With a whopping 102 DIRTcar UMP modifieds in the pits, three-time DIRTcar Nationals champion Nick Hoffman claimed his first victory of the 48th annual DIRTcar Nationals on Thursday night at Volusia Speedway Park. 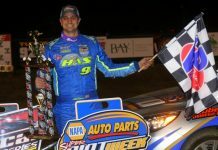 Hoffman survived a ferocious charge from a hard-charging Kyle Strickler and polesitter David Stremme. 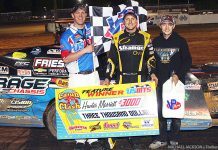 Stremme and Hoffman led the 28-car field Dave Farney’s green flag for their highly anticipated feature. Hoffman zipped out to the early race lead, but that was short-lived as Stremme charged back by to take the point on the second lap. Fifth-starting Lucas Lee emerged from the pack and slipped past both Hoffman and then Stremme to take over the top spot with Stremme and Hoffman in tow. Soon, Strickler, who started 11th, joined the trio up front as the crossed flags signal was given. With the laps counting down, Stremme mounted a charge back at Lee and overtook him with just five laps to go. He brought Hoffman, Strickler and former NASCAR competitor David Reutimann with him as all four got by Lee. Hoffman looked high and low, trying to figure out a way back around Stremme and was able to do so with just three laps to go for the fourth lead change of the race. Strickler got by Stremme and tried in vain to catch Hoffman. 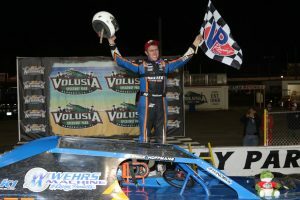 However, Hoffman was up to the challenge and would hang on for his first DIRTcar Nationals Feature win of 2019 and extended his streak of winning a Feature at Volusia in February to five years. Strickler settled for second with Stremme, Reutimann and Lee completing the top five. Nick Hoffman, Kyle Strickler, David Stremme, David Reutimann, Lucas Lee, R.C. 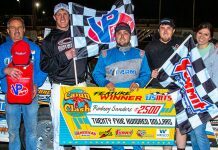 Whitwell, Curt Spalding, Brian Ruhlman, Chase Collins, Matt Crafton, Ray Bollinger, Tyler Evans, Justin Allgaier, Garret Stewart, Allen Weisser, Shon Flanary, Will Krup, Tyler Nicely, Michael Altobelli Jr., Ryan Ayers, David Wietholder, Jason Beaulieu, Todd Neiheiser, Zeke McKenzie, Will Long, Brandon Green, Dave Baldwin, Ryan Thomas.